New Tesla Model 3 electric vehicles. Tesla burning the midnight oil to hit a long-elusive target of making 5 000 Model 3 vehicles per week failed to convince Wall Street that the electric carmaker could sustain that production pace, sending shares down 2.3% yesterday. Tesla met the target by running around the clock and pulling workers from other projects, workers said. The company also took the unprecedented step of setting up a new production line inside a tent on the campus of its Fremont factory, details of which chief executive Elon Musk tweeted last month. Tesla's heavily-shorted shares rose as much as 6.4% to $364.78 in early trading, but sank after several analysts questioned whether Tesla would be able to sustain the Model 3 production momentum, which is crucial for the long-term financial health of the company. "In the interim, we do not see this production rate as operationally or financially sustainable," said CFRA analyst Efraim Levy. "However, over time, we expect the manufacturing rate to become sustainable and even rise." Levy cut CFRA's rating on Tesla stock to "sell" from "hold". Tesla, which CEO Elon Musk hailed on Sunday as having become a "real car company", said it now expects to boost production to 6 000 Model 3s per week by late August, signalling confidence about resolving technical and assembly issues that have plagued the company for months. Tesla also reaffirmed a positive cash flow and profit forecast for the year and announced that Doug Field, senior vice-president of engineering, was stepping down after five years with the company. Tesla has been burning through cash to produce the Model 3 electric car. Problems with an over-reliance on automation, battery issues and other bottlenecks have potentially compromised Tesla's position in the electric car market as a host of competitors prepare to launch rival vehicles. While UBS analyst Colin Langan said there was some relief the company hit the Model 3 production target, he noted that second-quarter vehicle deliveries of 40 740 missed his expectation for 51 000 and the consensus estimate of 49 000. He also questioned whether the company could keep up the faster production and its profit outlook. "We're very worried about quality and if you read the reports online, there are significant quality issues. They still haven't proven they can produce these profitably. The math is very challenging in getting to a sustained profit," said Langan. Model 3 production tripled to 28 578 in the company's second quarter from the previous quarter, Tesla said. 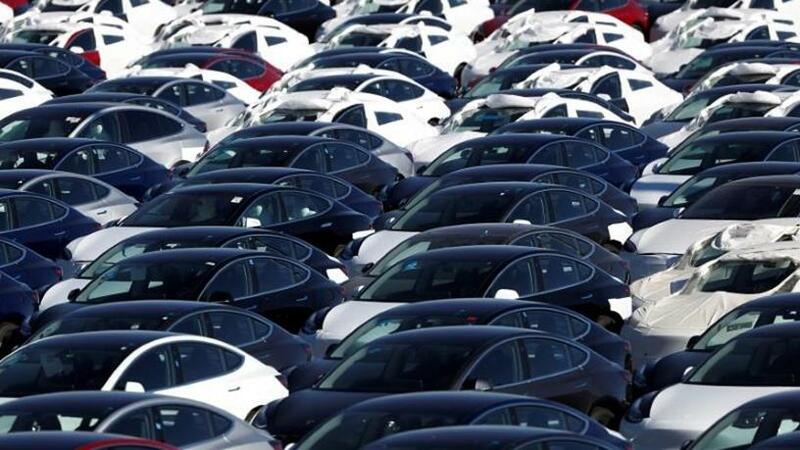 The company said 11 166 Model 3 vehicles were in transit to customers at the end of the second quarter, and would be delivered early next quarter. Reservations at the end of the second quarter stood at roughly 420 000. Tesla has delivered 28 386 Model 3 cars to date. Model 3 reservations totalled 450 000 at the end of the first quarter. The company said it expects orders to grow faster than the production rate after it starts allowing potential customers to see and test drive Model 3s at local stores. Despite originally touting the Model 3 as a $35 000 vehicle, Tesla has yet to begin building that basic version and instead is building a higher-priced model as it tries to come out of "production hell". The prices of Tesla's three convertible bonds were little moved by hitting the production goal, suggesting that share price volatility discouraged bondholders from converting their securities into equity despite the positive production news. As of Friday's close, 34.83 million Tesla shares or 27.5% of the shares available for trading were sold short and investors did not appear to be covering their positions ahead of Monday's announcement, according to Ihor Dusaniwsky, MD of S3 Partners, a financial analytics firm. "You wonder are traders maxed out on risk on Tesla. At a certain point you're gorged. You can't take another bite," he said. Tesla's milestone achievement did not alter a recommendation to short Tesla stock from David Kudla, founder and chief executive of Mainstay Capital Management in Michigan. Selling shares short is a bet the price will fall. "The push to meet these self-imposed targets makes one question what cost was incurred to build these cars and how was quality adversely impacted," said Kudla, who is personally short Tesla stock. "Whether somebody is short at $361 or $300 they're going to be fine."